Lots of exterior photos here because I was on foot. This store is located just east of the central downtown area of the small town of Hamburg. Originally a Kings (not Kings; I'm referring to a small PA chain acquired by Weis), this store even was still using King's carts at the time of my visit. Despite this, the store has been extensively remodeled inside with Weis's second-to-newest decor package. It's also been expanded into a few neighboring storefronts, giving it a slightly awkward L-shaped layout. You walk in to deli/prepared foods, with produce at the back of the first aisle. Meats continue along the back wall, with dairy and frozen at the far end. Bakery is in the front corner opposite the entrance, but the expansion with pharmacy and HABA actually extends beyond the front end to form the bottom part of the L.
It had just rained. So when I was leaving, I was lucky enough to catch the store with a rainbow in the background. 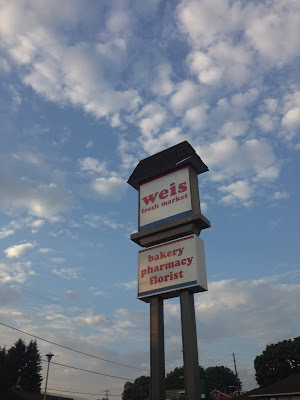 Forget a pot of gold at the end of the rainbow, how about a Weis Market? Here we can see the store's monument sign, complete with a little hat. I'd assume that the facade originally matched this, with a similar look to A&P's 1970s mansard roof design. One last look at the rainbow, plus a glimpse of the facade style I mentioned to the right. The main supermarket is to the right. First aisle with deli/hot foods on the right side wall. The floral department is to the right of the entrance, in front of the deli department. Here's a look at the entrance with a sale alcove to the right. The front end continues to the right of this shot. A remarkably good picture of what I consider to be some of the most attractive supermarket decor among middle-market supermarkets. I think the colors are bold and attention-grabbing, and the text is very well-done. I also appreciate the added visual interest of the patterns along the background. Continuing along the back of the store, we see meats, then packaged deli and frozen seafood. There is no service seafood here. Pretty decent international selection for a mainstream supermarket. It's not even worth comparing this store to a Food Bazaar or SuperFresh Food World, but they're better than ACME, for instance. Not a bad start. Although there's no service seafood, it doesn't look like there ever was, so they didn't take out a feature the store had. But what happened to the dairy department? Okay, I don't think this cow is part of the actual decor package. But more importantly, is there anywhere else they could have put it? Other than right in front of the milk sign? Anyway...here's a look at the bakery in the front corner. Surprisingly full in-store bakery for a very small supermarket. Google Maps estimates the store is in the 25,000-30,000 square foot range. That's right folks, you're looking at the five registers this store has! Here you can also see the pass-through to pharmacy and HABA past the front end. The bakery is just to the right out of frame here. It's a pretty substantial expansion. It allows for the store to sell all of this HABA and general merchandise without taking up valuable real estate in the grocery aisles. As I mentioned, the ceiling is low here due to offices on the second floor. Here we're looking back up towards the main store area. Limited decor in this section again on account of the low ceilings. Looking from the registers over to the pharmacy pass-through to bakery and then dairy on the far side. I loved this little Weis! It's got the personality and friendliness of a small town supermarket but the selection and prices of a chain store, plus I really like the decor. I started this post on a random side note and will end on one too: if you're ever in Hamburg, stop by Russo's Family Restaurant & Pizzeria at 2 S Fourth St. Great food! I know, right? One of my friends was complaining that he wasn't sure what to do in some spare time that he had, and didn't seem to love my suggestion of starting a supermarket blog. Oh well, less competition I guess.